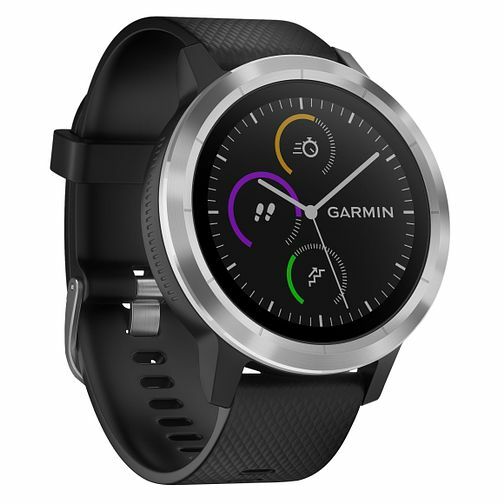 Combining the sporty style of a wristwatch with the functionality of an activity tracker, this Garmin smartwatch tracks steps, monitors sleep and syncs with the Garmin Connect mobile app to let you view your stats in full. Finished with a smart black silicone strap, this smartwatch will keep you prepared for any adventure. Garmin Vivoactive 3 Black Silicone Strap Smartwatch is rated 5.0 out of 5 by 2. Rated 5 out of 5 by Anonymous from Great fitness watch and quick delivery I got this because I was fed up of my Apple Watch 2 running out of charge. A friend showed me his garmin and I was impressed with the app and the look and quality of the watch. The Vivioactive does exactly what I want it to and lasts up to 4 days between charges with light use and a couple when tracking longer activities like 4 hour bike rides. It’s stylish, easy to use and recommended. I prefer it to the Apple Watch as it doesn’t try to do everything, instead doing what it’s meant to do very well.